This set contains an Eau de Parfum and a shower gel. These evoke a feeling of masculinity which is bold and sophisticated yet enticing. It features a complex and masculine opening with spicy notes of black pepper mixed with sweet pineapple which further renders it fetching. 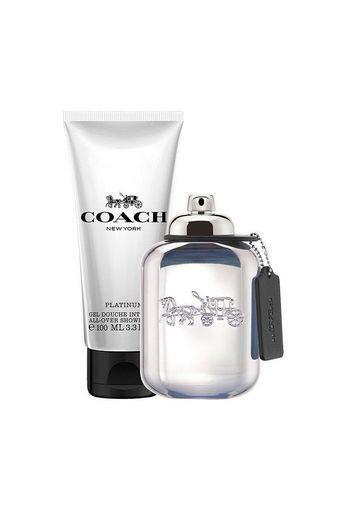 Coach presents this mens perfume set, which will enhance and unfold the layers and characteristics of men, making them all the more handsome. Coach was founded in 1941 in the heart of New York City on 34th Street in a family-run workshop under the name of Manhattan Leather Bags. Inspired by the design of a baseball glove, the company started off with the creation of handbags with similar design attributes: tan, supple, high-quality leather with high standards of craftsmanship. For the second half of the 20th century, Coach went on to become a world-renowned brand and a pioneer of the leathergoods industry, establishing itself as the original american house of leather. Coach today is a New York design house of modern luxury accessories and lifestyle brands, pairing exceptional leathers and materials with innovative design.